Secretary Nancy Gadzuk read the minutes from the July 16 open meeting, which were approved as read. 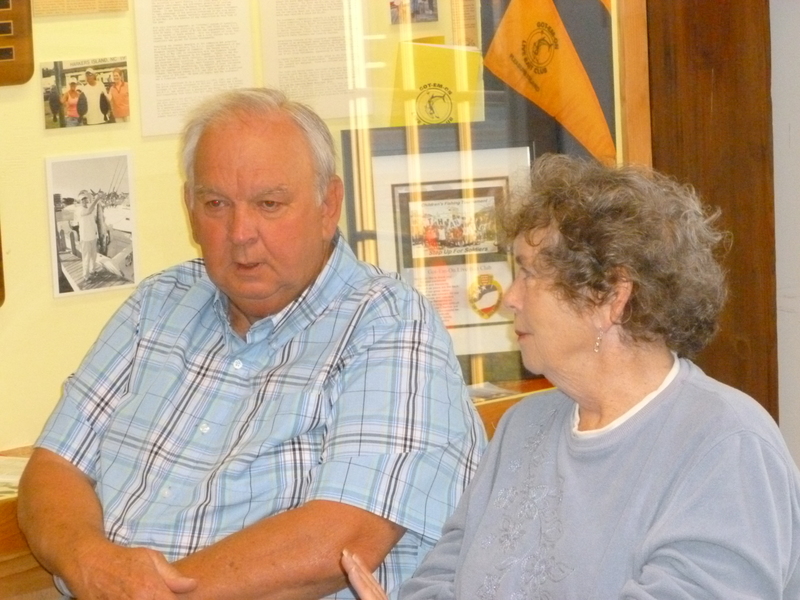 Board Chairman John Gordon announced a new History Center building maintenance initiative. He is looking for volunteers, especially those with electrical and carpentry skills, and he will provide more details at the September open meeting. Rick Both provided an update on the proposed Joseph Ryder Lewis Jr. Civil War Park. A wetlands survey is underway to determine where walkways can be placed to preserve both the wetlands and the Civil War earthworks. Elaine then introduced the main speaker of the evening, Captain Dennis Barbour. 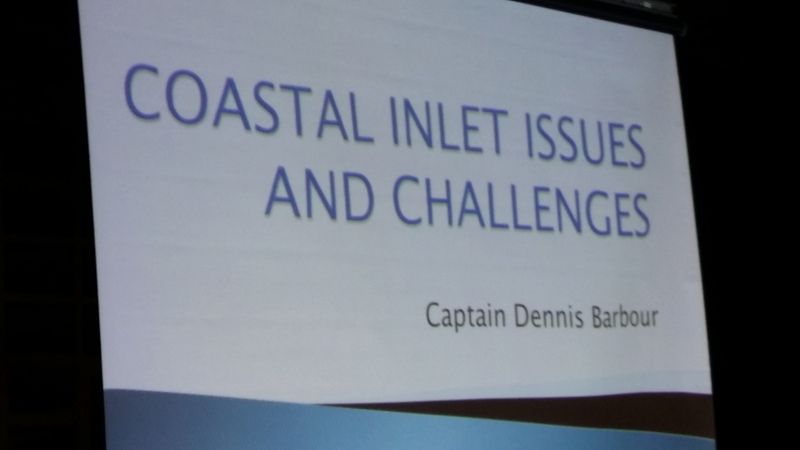 Dennis spoke on Coastal Inlet Issues and Challenges. Dennis started by reeling in members of the audience, including Skippy and Jay “Cowboy” Winner and sharing some of their boating adventures when the Carolina Beach Inlet was first formed in 1952. His presentation then focused on the economics, politics, and thinking outside the box involved in keeping the Carolina Beach Inlet open and navigable. 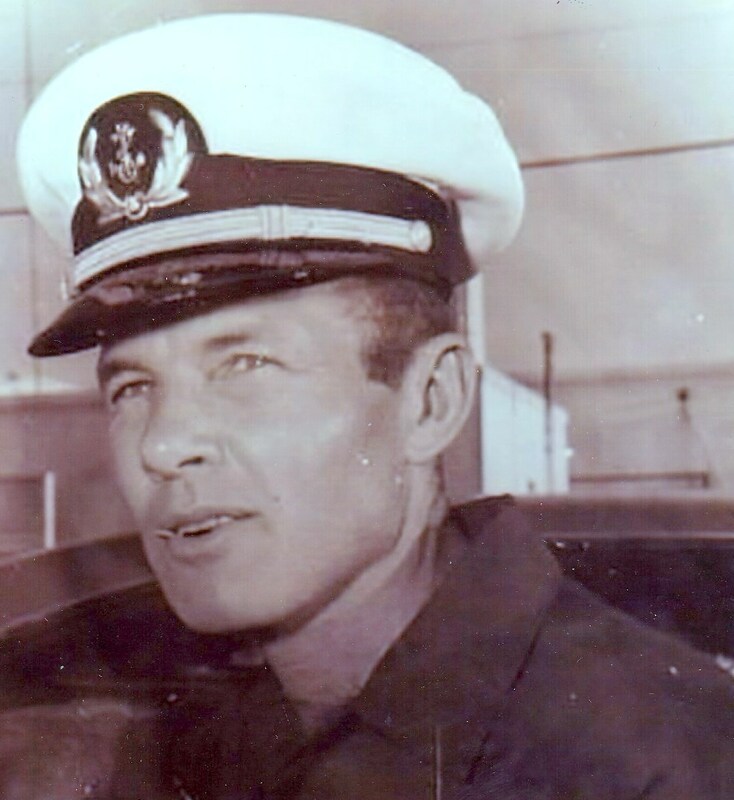 Dennis moved ahead more than 50 years to the elimination of all Federal funding for maintenance dredging for Carolina Beach Inlet, due to a ban on Federal earmarks. An economic study for Pleasure Island showed closure of the CB Inlet would have a $75 million negative impact over a five-year period. This would be devastating locally. 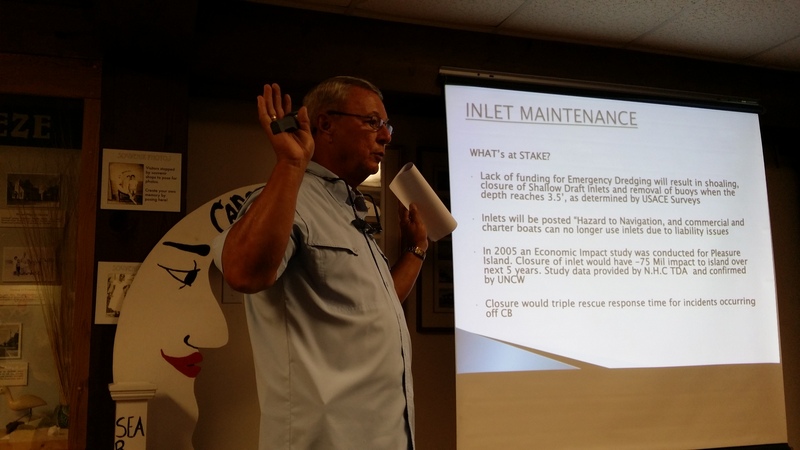 The Carolina Beach Inlet Association was formed to address the issue. Dennis talked about the need to meet face to face with legislators in Raleigh to build awareness, and the value of offering them scrambled eggs and breakfast coffee. In return, members of the Association had the opportunity to share their concerns and suggestions for keeping the inlets open with the legislators. By 2013, the State Senate had passed Senate Bill 52, which provides dedicated 50/50 matching funds to maintain the state’s five shallow draft inlets, including Carolina Beach Inlet. 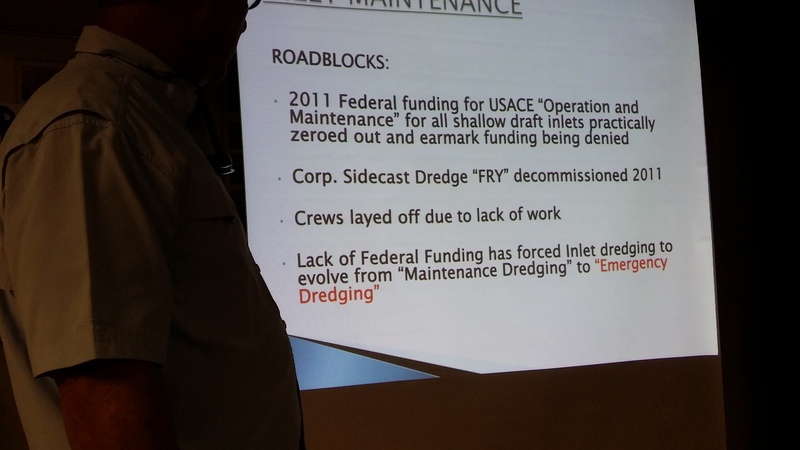 That still means coming up with $450,000 each year to cover the local share of the dredging fee. Currently, the county/local matching funds are coming from the un-incorporated county room occupancy tax, which will last only until 2019. Then what? A Federal Permit application has been filed to allow New Hanover County to contract with private dredging company, which could eventually provide some funding. But other sources of funding will be needed. 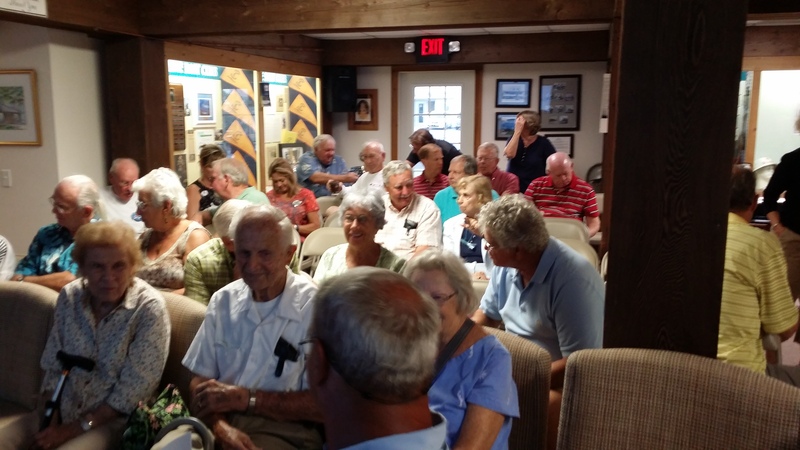 The Carolina Beach Inlet Association would welcome hearing other ideas. As Dennis put it, it’s all about money. The presentation ended with a short Q&A session and the meeting adjourned at 9:00 p.m. for refreshments. The next meeting of the FPHPS will be Monday, September 21 at 7:30 p.m. at the History Center.